Idris design ... innovative solution. 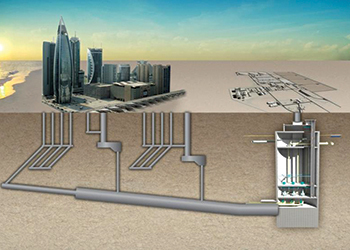 A French-Qatari partnership has been awarded two contracts by Qatar’s Public Works Authority (Asghal) for the design and construction of sewage tunnels worth €550 million ($619 million). Bouygues Travaux Publics (a subsidiary of Bouygues Construction) has teamed up with local contractor UrbaCon Trading and Contracting to undertake the construction of two sewage tunnels in Doha. The north section (MTS01) will be 16 km long and 3 m wide and the south section (MTS03) will be 14 km long and 4.5 m wide. Bouygues TP’s share of the contracts amounts to €285 million ($320 million). These contracts are part of the strategic project for sewage collection, pumping and treatment services in the south of Doha, known as Idris (Inner Doha Resewerage Implementation Strategy). In recent years, the capital has experienced sustained population growth, which has necessitated the redesign and expansion of its sewage system. The system has been designed according to the principles of sustainable development, making use of gravity to ensure the flow of wastewater in the tunnels. The project began this summer, with handover scheduled for 2019. Bouygues Construction has been present in Qatar for several years. Its Bouygues TP subsidiary constructed liquid gas storage reservoirs in Ras Laffan in the north between 1993 and 1996, while Bouygues Batiment International is finishing off its first project in the country, the Qatar Petroleum District – a 700,000 sq m property complex including nine office towers, a five-star hotel with 400 bedrooms, 5,300 parking spaces, a conference centre, among other facilities. Bouygues Construction has seen a surge in its overseas business in 2015. Earlier this year, Bouygues Travaux Publics as part of a consortium led by Vinci Construction Grands Projets, secured a contract for the new phase of civil engineering for Line 3 of the Cairo metro between Haroun and El Nozha stations in the Egyptian capital. The new phase of works (Phase 4A) worth €264 million (300 million) continues on from Phase Two, which was brought into service in May 2014. Phase 4A consists of 5.15 km of tunnel and five underground stations on Line 3, the east-west link across the Egyptian capital. The consortium, which includes Egyptian partners Orascom Construction and Arab Contractors, has committed to a very short delivery deadline of 34 months based on the experience it has acquired over more than 30 years of working on the metro, and to a technical innovation. In a first worldwide, earth pressure balance tunnel boring machine Imhotep, used for the previous phase, will be modified to operate as a slurry pressure balance machine. This change will generate savings for the joint venture on both its execution time and budget. As a global player in construction and services, Bouygues Construction designs, builds and operates public and private buildings, transport infrastructures and energy and communications networks. A leader in sustainable construction, the group and its 53,500 employees have a long-term commitment to helping their customers shape a better life. In 2014, Bouygues Construction generated sales of €11.7 billion ($13.12 billion).